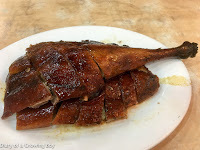 The Hungry Tourist is back in town, and as usual, he made lunch at Yat Lok (一樂燒鵝) his first stop after landing. Since the place is literally one minute's walk from my office, I agreed to join him for a late lunch. With just the two of us, I proceeded to order us a lower quarter of roast goose (燒鵝下庄). This would guarantee us one of the coveted drumsticks. I still love the paper-thin, crispy skin... which is full of flavor from the spices they use to marinate the bird. Just delicious. But even with the Hungry Tourist getting a bowl of dumplings and me with my plate of steamed rice, this just wasn't enough food. 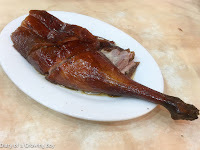 So we ended up getting another roast goose drumstick (燒鵝脾)... NOW we were satisfied! I bid my friend farewell, and look forward to our next meeting - in two days.